Author(s): Nisha Vijayakumar, Micheal Acheampong, Jennifer Marshall, Foday Jaward. Phthalates are ubiquitous compounds that are used as plasticizers in a wide range of items including children’s toys, personal care products, flooring materials, etc. Phthalates are not chemically bound and tend to leach into the environment and settle on the ground. Young children are vulnerable during the critical window of development to phthalate exposure as they spend most of their time on the ground. There have been associations of phthalates with allergic conditions like asthma, endocrine disruption, developmental delays and neurological deficits. In Florida, there are about 9264 day care centers and about 98% of children in out of home child care spend 8 hours per day or more in these centers. Given the substantial amount of time children spend in these environments, it is important to recognize them as prime sources when quantifying phthalates exposure in children, especially via dust. The objective of this study was to estimate concentrations of phthalates in dust in the day centers with children between the ages of 6 weeks to 6 years in Tampa Bay area. A cross sectional study was designed to estimate the concentrations of phthalates in dust among day care centers in the Tampa Bay region. This was to highlight the importance of non-dietary exposure to phthalates in children between the ages 0 – 6 years and to assess the risk posed by these chemicals. Day care centers in different parts of Tampa Bay were recruited to participate in the study. Dust samples were collected from the carpets in rooms in which the children play or spend time. Wipe samples were also collected from the desks and chair. The sample extracts were analysed for phthalates using USEPA method 8061A in a GC/MS. Identification and quantification were carried out against five calibration standards using the internal standard. 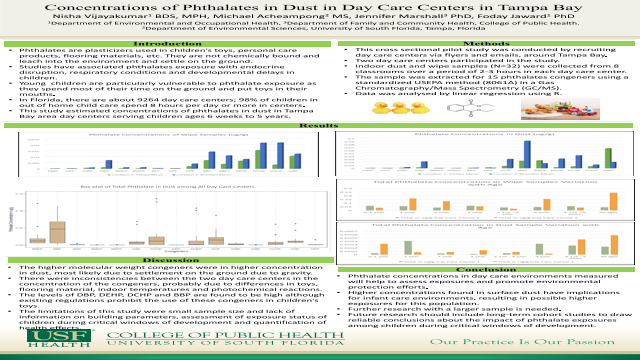 The results of the study show that the phthalate concentrations in dust were different among different day care centers. The phthalates congeners like BBP, BBEP, DHP, DBP, DCHP, DHEP, DnOP, DNP were found to be predominant in the samples. The molecular weight of the congener determined the concentration of the congener that was settled in dust. The higher the molecular weight of the congeners, the higher the concentration in dust due to increased settlement on the ground. The mean concentration of the DEP, DEHP, BBzP and DnOP in dust at the day care centre were 0.000197 ug/ul, 0.0346 ug/ul, 0.0582 ug/ul and 0.0088 ug/ml respectively. The mean concentrations in the wipe samples were 0.00011 ug/ul, 0.0073 ug/ul, 0.0106 ug/ul and 0.0126 ug/ul respectively. The higher molecular weight congeners of phthalates were more likely to be present in the dust due to its presence in flooring material such as PVC, wall covering, furniture’s, toys etc. In addition, higher molecular weight congeners are more likely to settle on the ground than lighter ones. Although the results are consistent with the literature, there are a few limitations that must be considered before these any conclusion can be drawn. The study was done considering only 2-day care centers, there was little information regarding the building characteristics of the day care centers, water leaks and the ventilation systems used. The materials that were used for the flooring and interiors were not considered. Only concentrations of phthalates in dust were analyzed using wipe sampling and vacuum sampling. Also, the impact of the presence of phthalates on children’s health was not studied. The phthalates such as DEP, DEHP, BBzP and DnOP in dust were in increased concentration. Although this study provides information on the amount of phthalates in dust, conclusions cannot be drawn due to the limitations of the study. There is a need to conduct further research with a larger sample and more attention to environmental conditions to able to draw a reliable conclusion.